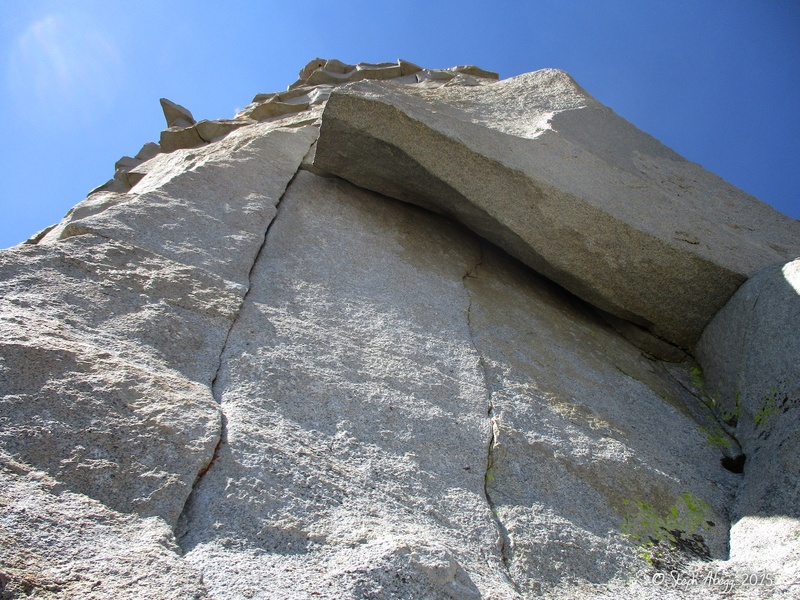 Five pitches have excellent climbing on very high quality granite. 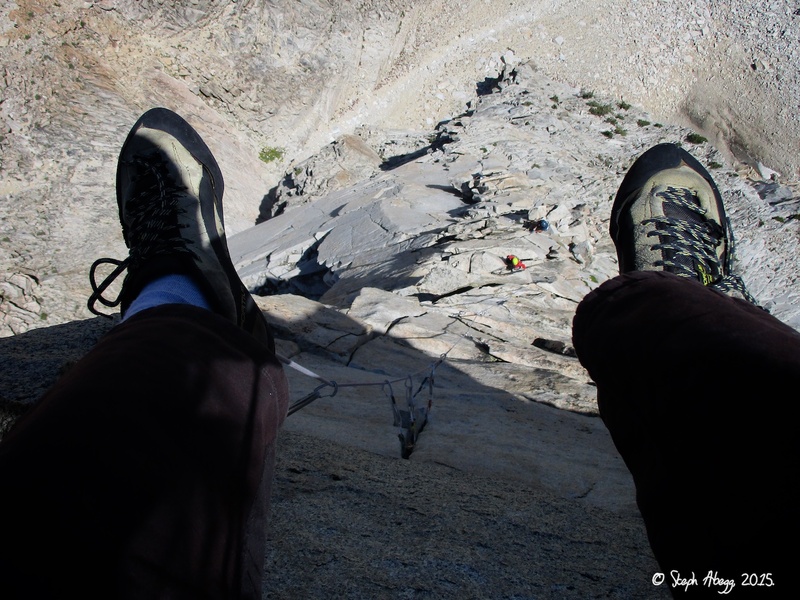 Climbing the Regular Route (5.10b) of the Third Pillar of Dana, view from the top of the final pitch looking down the entire route. Photo by Mark Thomas. 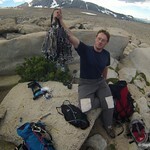 This page contains two trip reports for Third Pillar. 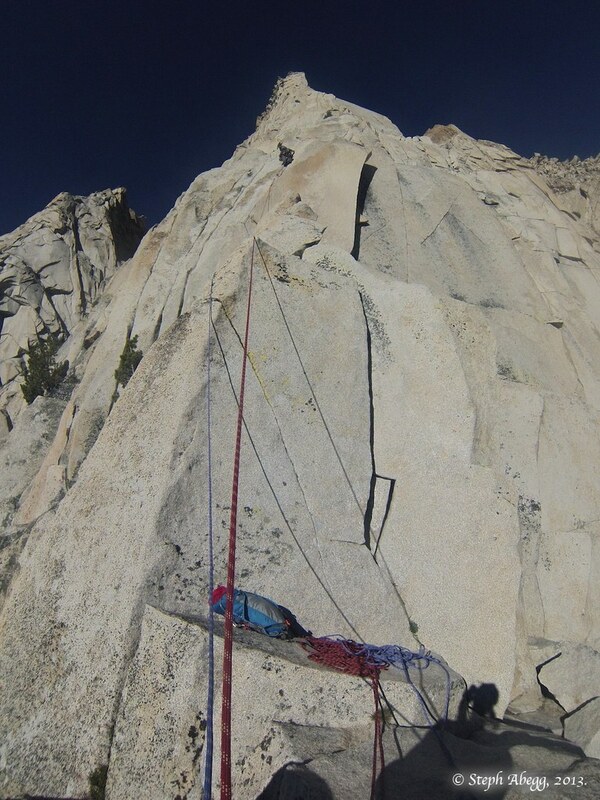 This route is good enough to do more than once! 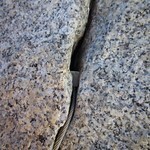 High quality Sierra "alpine" granite. High quality Sierra "alpine" granite in an almost surreal setting, the Third Pillar of Dana sits at the edge of the Dana Plateau with views of Mono Lake thousands of feet below. 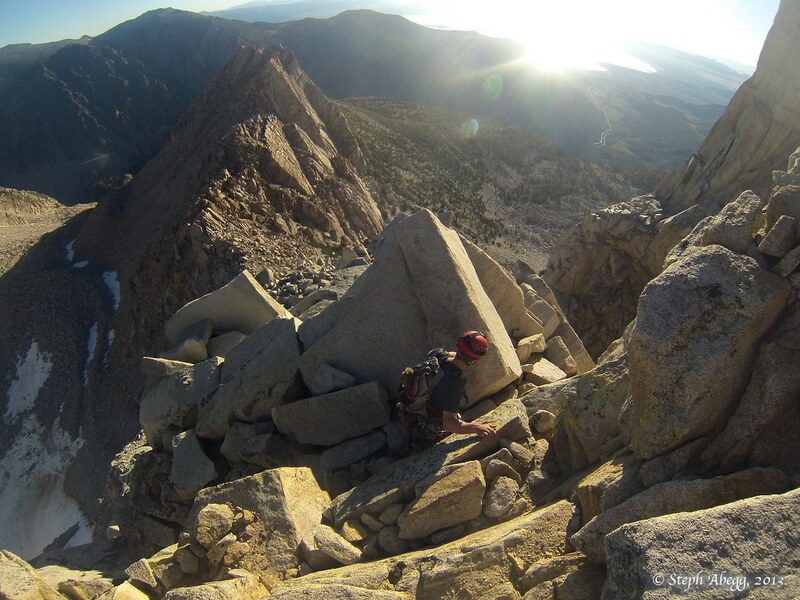 One of the more popular routes in the Sierra, the Regular Route of the Third Pillar sees its share of traffic. 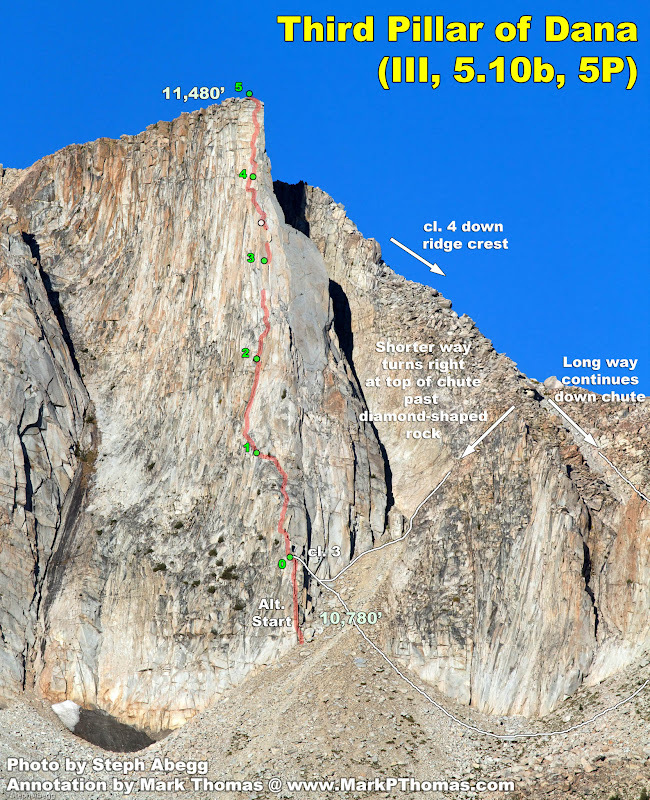 The route has five pitches of mostly 5.9 to 5.10+ climbing; the final pitch is often thought of as perhaps the most dramatic and highest quality single pitch in the High Sierra. I can't think of a better way to spend a summer day. 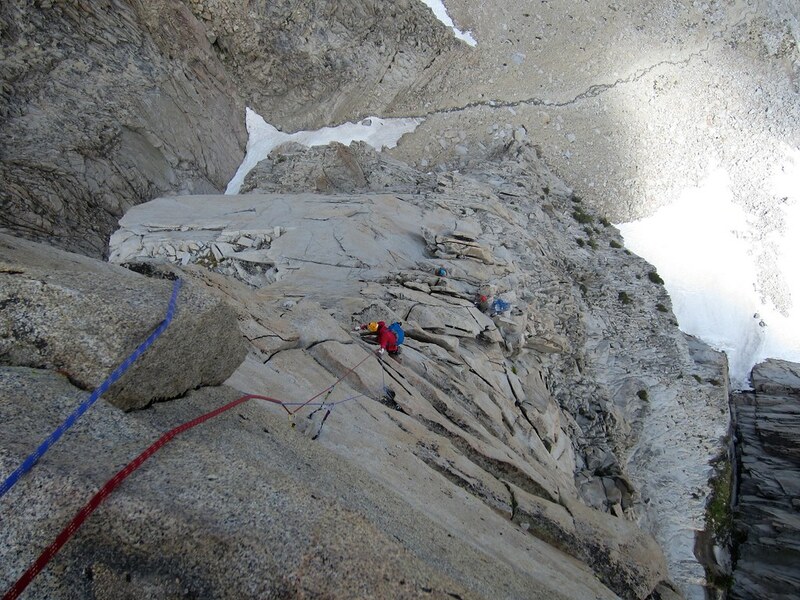 My friend Mark and I climbed the Regular Route on the Third Pillar of Dana in June 2013. 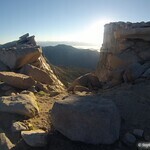 I brought my GoPro Hero3 helmet video camera on this climb. I wore it for Pitches 1, 2, 4, and 5 while Mark wore it on Pitch 3. We recorded footage of the entire route. 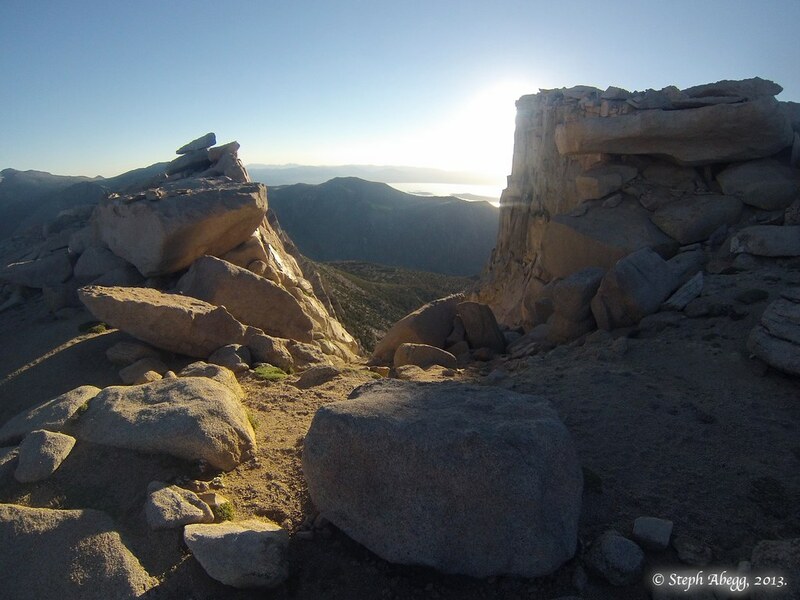 With the wide-angle head viewpoint, some of the footage is quite spectacular. 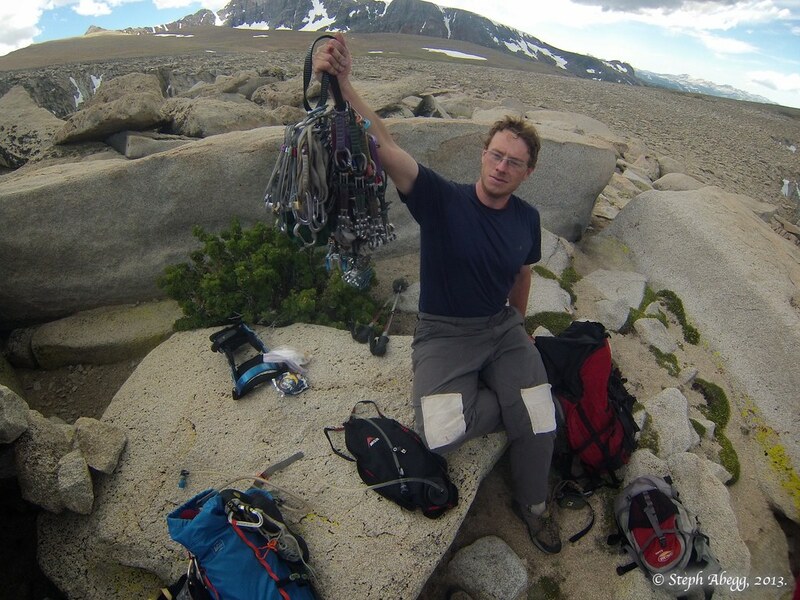 This trip report consists of some of Mark's excellent route overlays and a video to summarize the highlights of the climb. 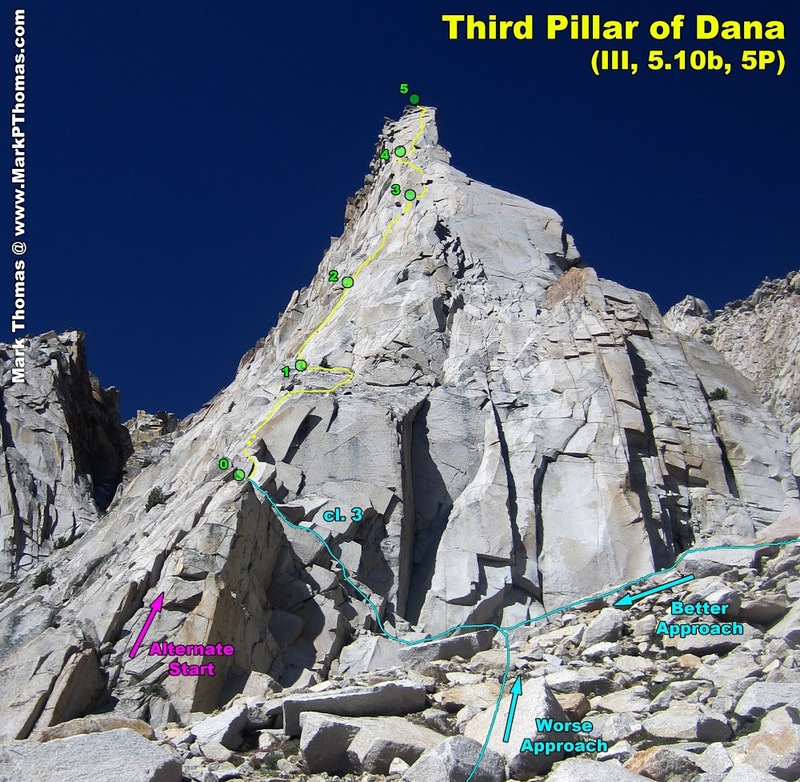 Annotated photo of the Regular Route on the Third Pillar of Dana. 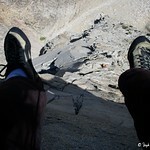 This photo was taken by Steph Abegg with her telephoto lens from Tioga Pass Road. Annotations by Mark Thomas. 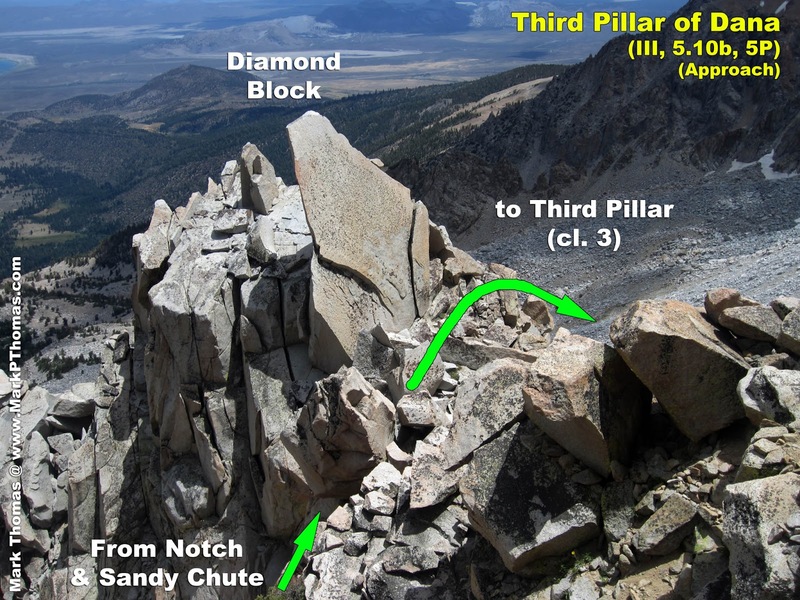 Annotated photo of the Regular Route on the Third Pillar of Dana. This photo was taken from below the pillar. By Mark Thomas. Annotated photo of the upper pitches of the Regular Route on the Third Pillar of Dana. By Mark Thomas. 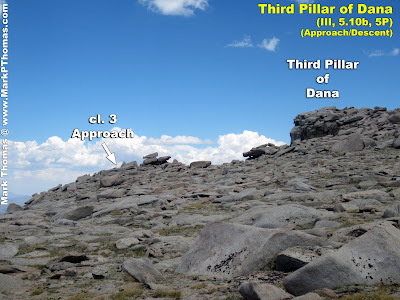 Annotated photo of the start of the Regular Route on the Third Pillar of Dana. By Mark Thomas. 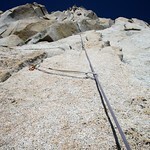 One of the cruxes of the climb as seen from my helmet videocamera. Just as fun the second time. 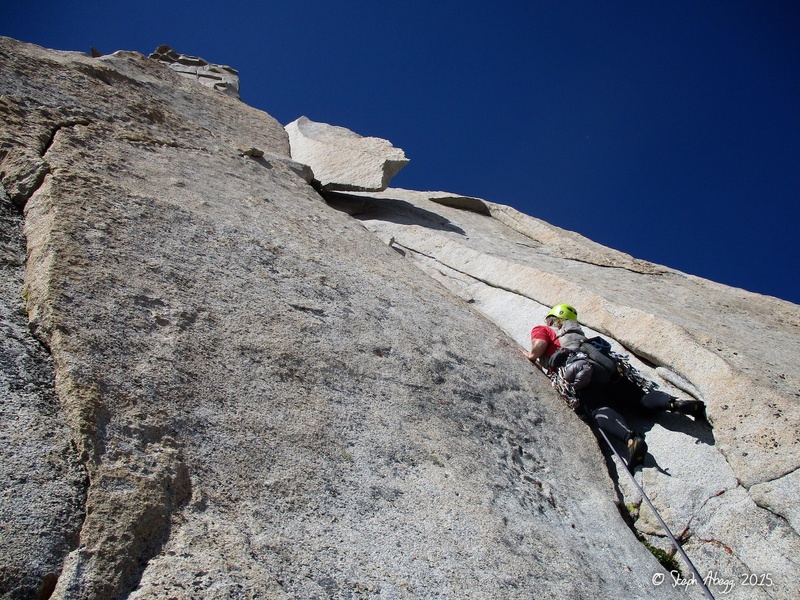 Third Pillar of Dana is the kind of multipitch objective you can climb again and again and never grow tired of it. 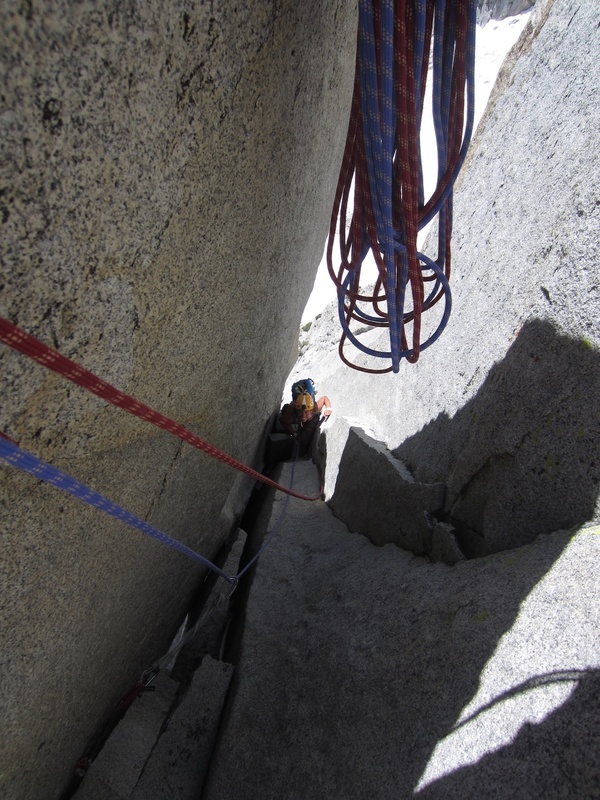 In the Summer of 2015, I spent much of my summer in the Sierra, and managed to squeeze in a Third Pillar day with my newfound climbing buddy Sarah Inwood (who I met in the Mammoth Lakes Library a week earlier). 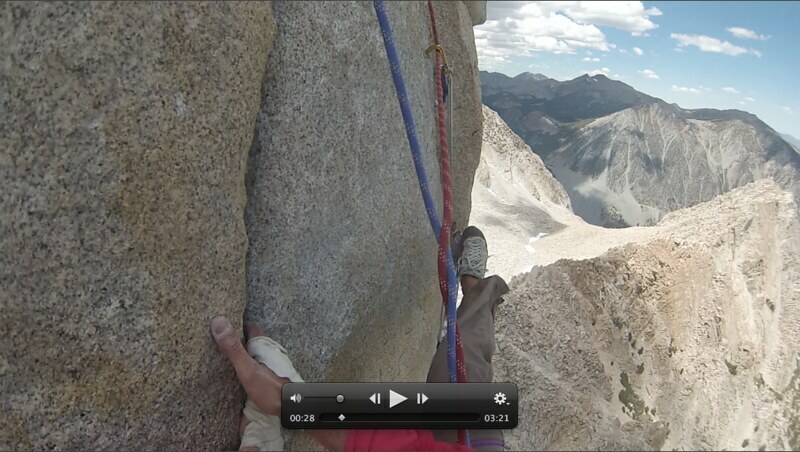 Climbing this route a second time gave me the opportunity to supplement my 2013 video trip report with still photos. 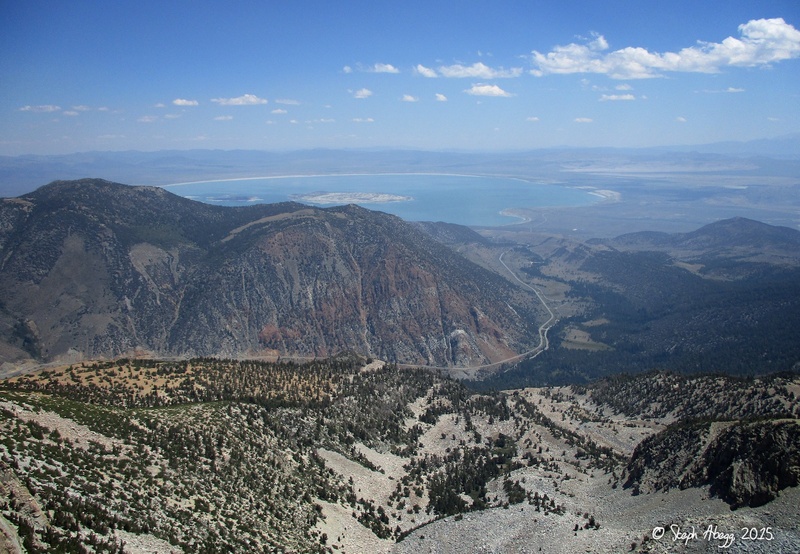 Interesting story: The night before the climb we slept at a dirt road pull-off near Lee Vining. I was sleeping in the back of my Subaru with the hatch open when a bear snuck up and grabbed a bag full of food from beside my head. By the time I realized what was going on and jumped out to scare the bear off, the bear had managed to rip into six packages of Belvita Bites. Belvita Bites are a type of granola bar cookie that comes in either Chocolate or Mixed Berry; although I had an equal amount of both flavors, all six packages the bear devoured were Mixed Berry. 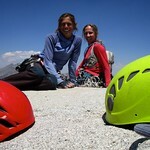 Sarah and I had a blast—perfect rock, perfect weather, perfect partner. 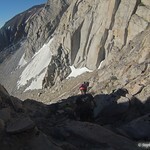 Below are some photos from the climb. 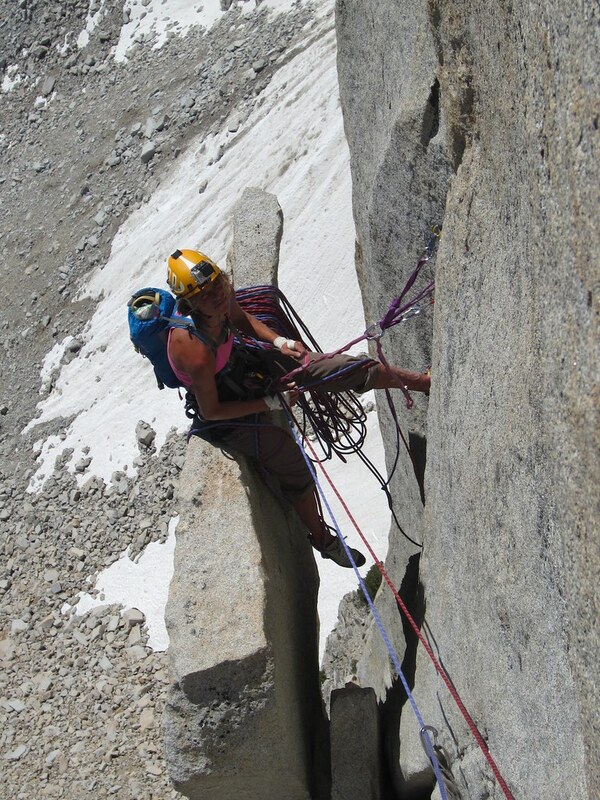 I've also included some photos from my climb of Third Pillar with Mark in 2013. 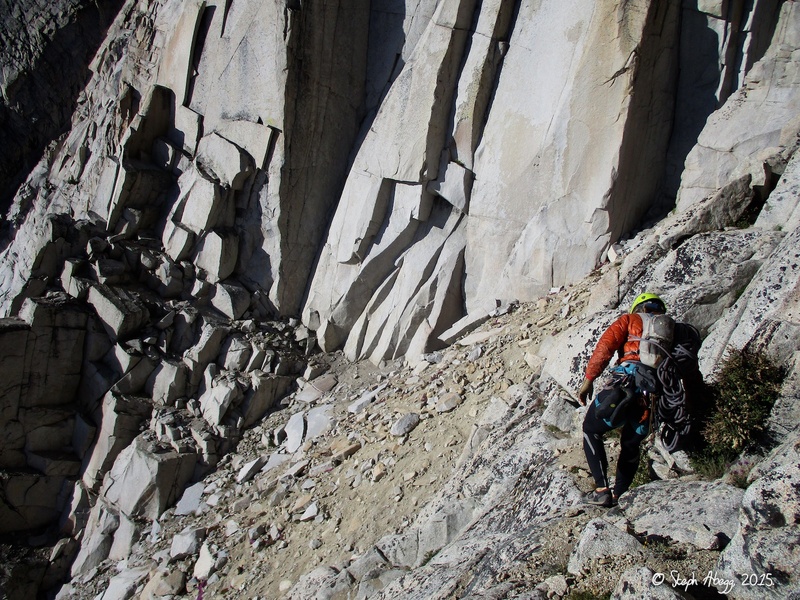 Approach From the Tioga Lake Overlook, drop down and skirt the right (west) end of the lake and follow a climbers' track up to the Dana Plateau and to the eastern edge of the plateau, looking for a slight promontory that marks the top of the route. Scramble down the 3rd class ledge to its left (north) to the toe of the buttress. 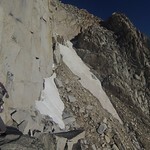 Cross the gully (snow in early season) and climb out onto the highest ledge. 1. From SuperTopo guide: "The striking prow of the Third Pillar of Dana will be visible 100 yards before you reach the dramatic edge of the plateau, and the top of the descent buttress is immediately to the west of the Third Pillar." 2. 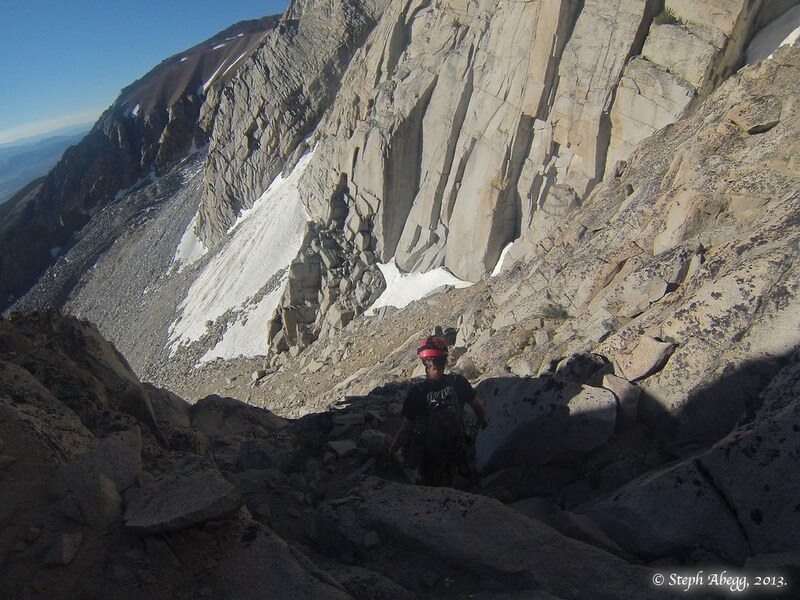 The stacked rocks on the left are where you descend. Photo/annotation by Mark Thomas. 3-5. 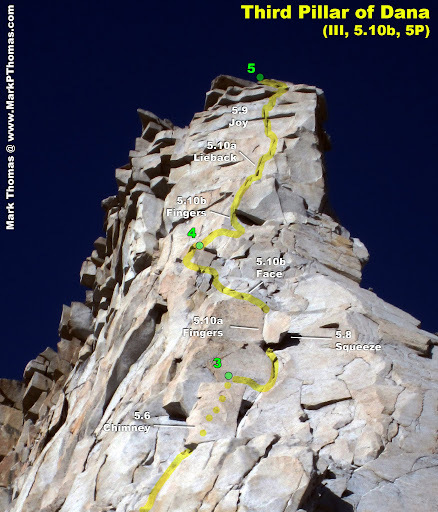 From SuperTopo guide: "Descend the buttress via low-angle 3rd class terrain; generally stay to the left, or 4th class drops must be negotiated. 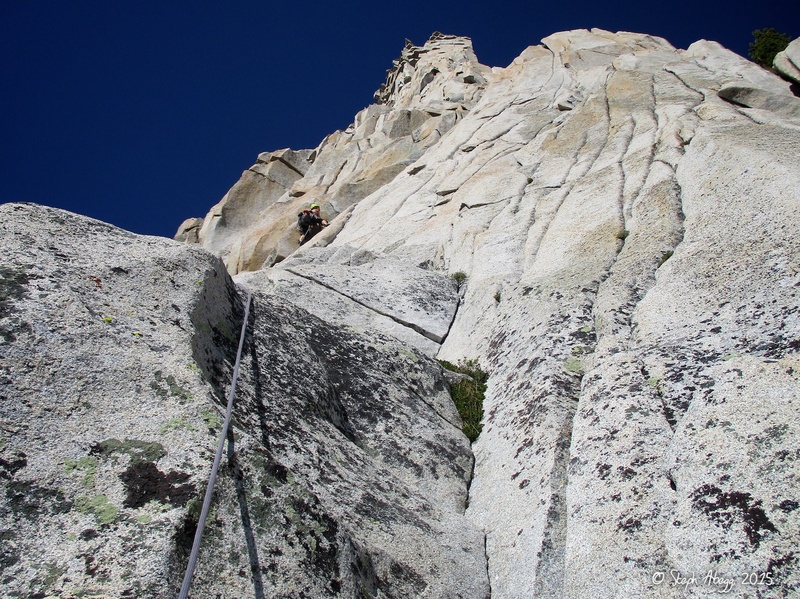 Cross the gully (snow in early season) to prominent ledges about 150 feet above the bottom of the rock on the Third Pillar." 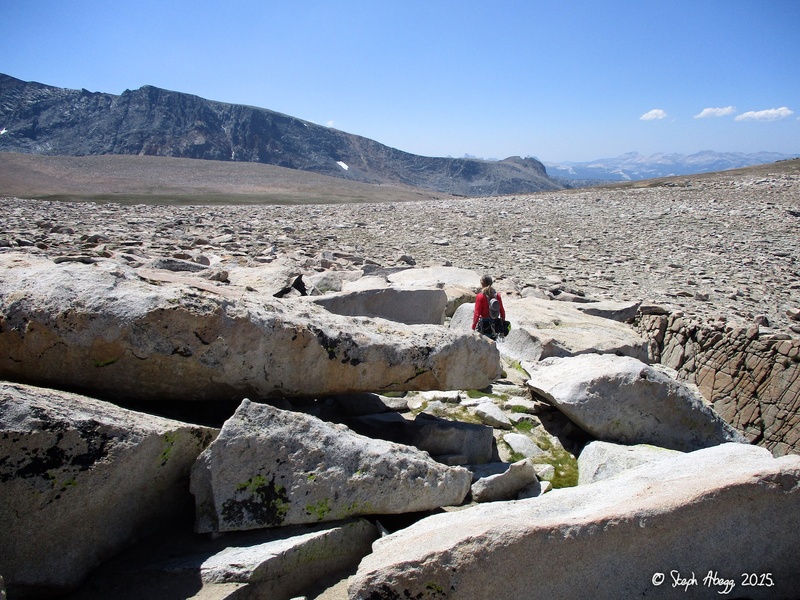 Photo 4 shows the obvious paddle/arrowhead/flask-shaped block that marks where you turn right and descend towards the snowless snow field. 6. Sarah approaching the base of the route. 2015 was a dry year so there was not even a patch of residual snow. The normal start of the route is on the ridgecrest at the end of the 3rd class ramp and about 15 feet below the giant flake. 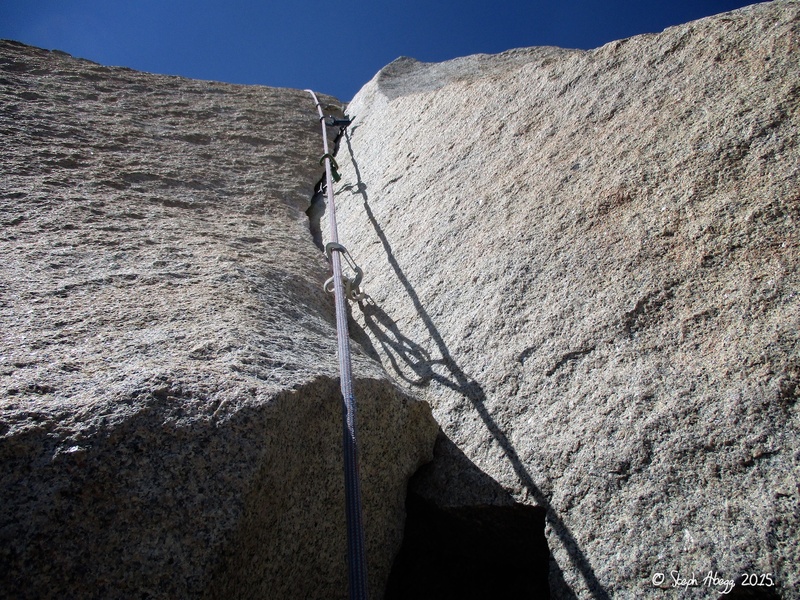 (There is a direct start that starts at the base of the Pillar about 160 feet lower; most climbers opt for the normal start, probably out of fear of getting cut off by a party opting for the normal start and because the rock quality is not quite as good at the toe of the Pillar. 7. Looking over at approach to Third Pillar of Dana from the base of the route. 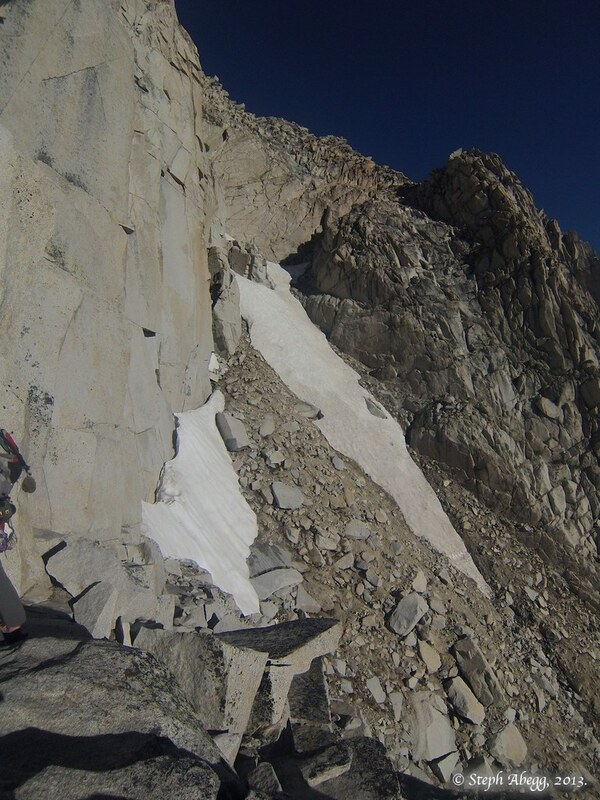 Even in June 2013, there was not enough snow to necessitate crampons or ice axe. 5.9. 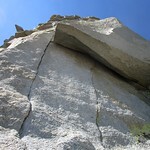 From a large horizontal ledge, climb up left around a large flake, and continue upwards. 8. 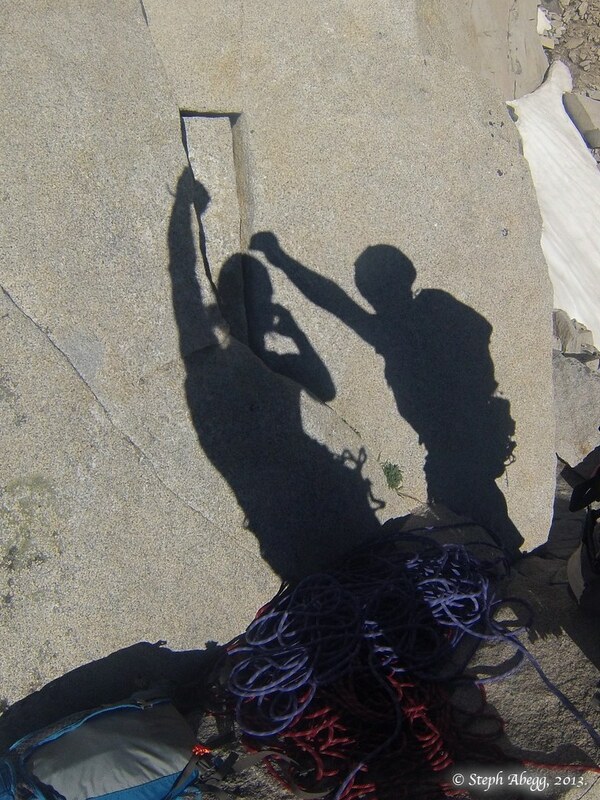 Some shadow fun at the base of the climb. 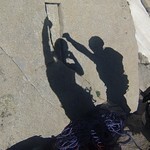 The sun is out and we are ready to climb! 9. Looking up the route. 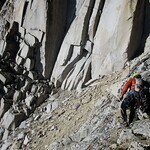 600 feet of great climbing ahead. 10a. 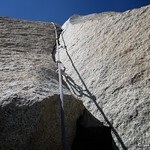 Go up left from the belay and into a corner with flaring fingers. 10. Looking up Pitch 2 from the belay. 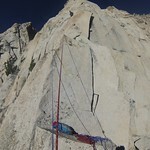 Sarah is just starting up the 10a flared fingers section. 11. A view up the Pitch 2 corner from below. Really great rock. 5.8. 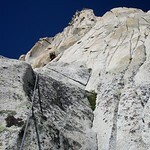 Head up, aiming for the top of an enormous flake, which makes quite a spectacular belay ledge. 12. 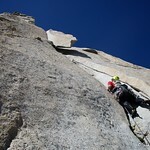 Steph climbing up the 5.6 chimney at the top of Pitch 3. Photo by Mark Thomas. 13. 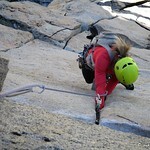 Steph at the wild top-of-enormous-flake-please-don't-peel-off-today belay at the top of Pitch 3. Photo by Mark Thomas. 10b. 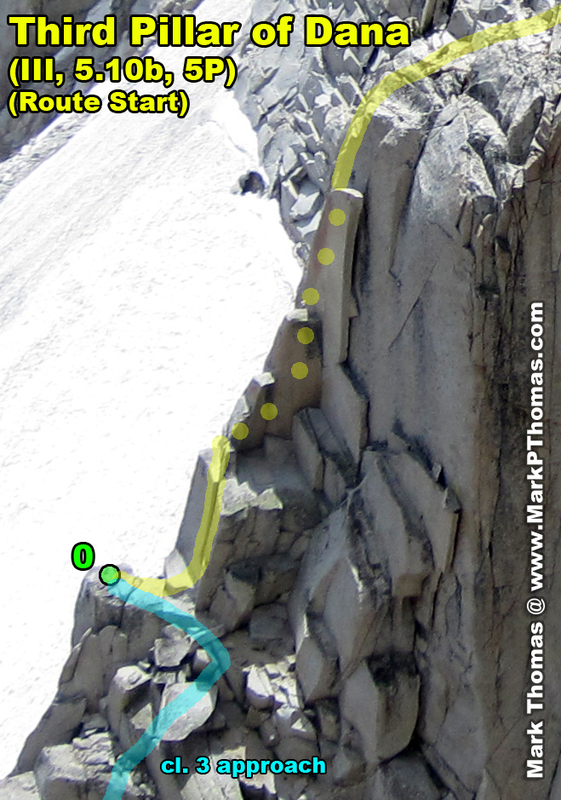 Go left (10a fingers) or right (5.8 flaring squeeze) around a detached flake. The second half of the pitch consists of 10a delicate face moves. 14. Sarah starting up Pitch 4. The giant detached flake looms above. There are two options to get around the flake: left is a sweet 10a finger crack and right is a burly 5.8 flared squeeze. 15. 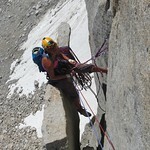 Sarah went up the finger crack. 16. Mark went up the flared squeeze. Photo by Mark Thomas while leading the squeeze. 17. 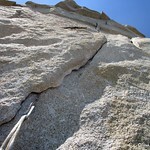 There's an excellent nut placement to protect the 10a crux on the face above the detached flake on Pitch 4. Both Mark and Sarah placed a nut here. Photo by Mark Thomas. 10b. 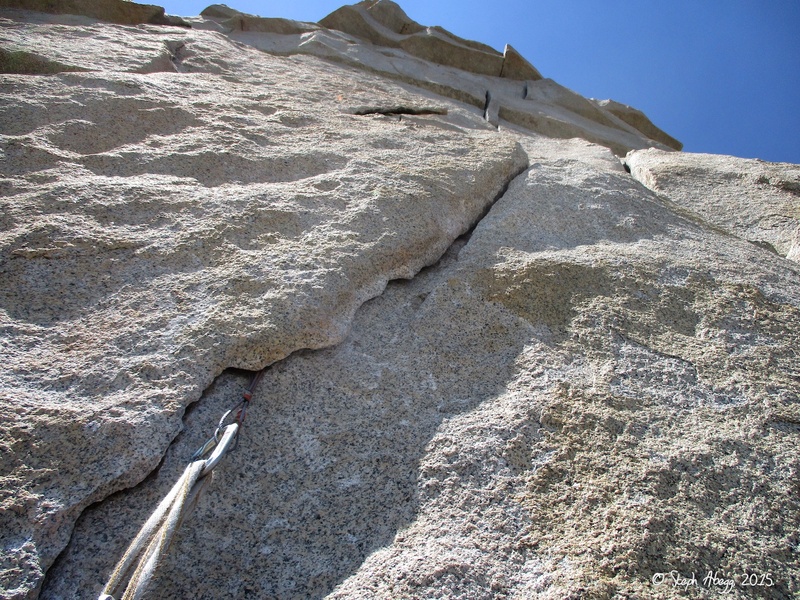 Climb up through two 10b cruxes (first crux is fingers and foot smears through a roof and second crux is a techy lieback with thin gear above a ledge). 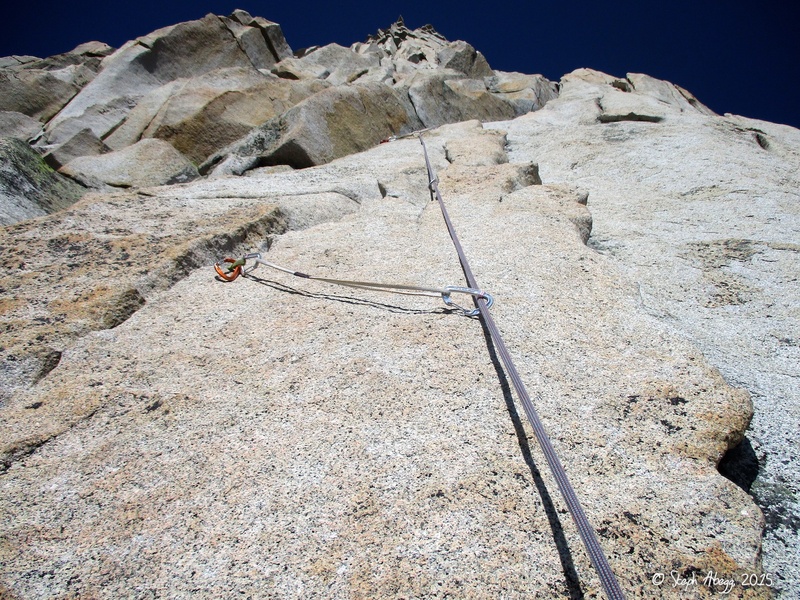 Then steep and fun 5.9 climbing the top—this section has been described as "the best 5.9 pitch in the universe" (Moynier, Sierra Classics, p. 280). 18. 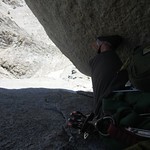 The first 10b crux on Pitch 5. This is fingers and smeary feet, but it can be protected well by first a black and then a green alien. 19. 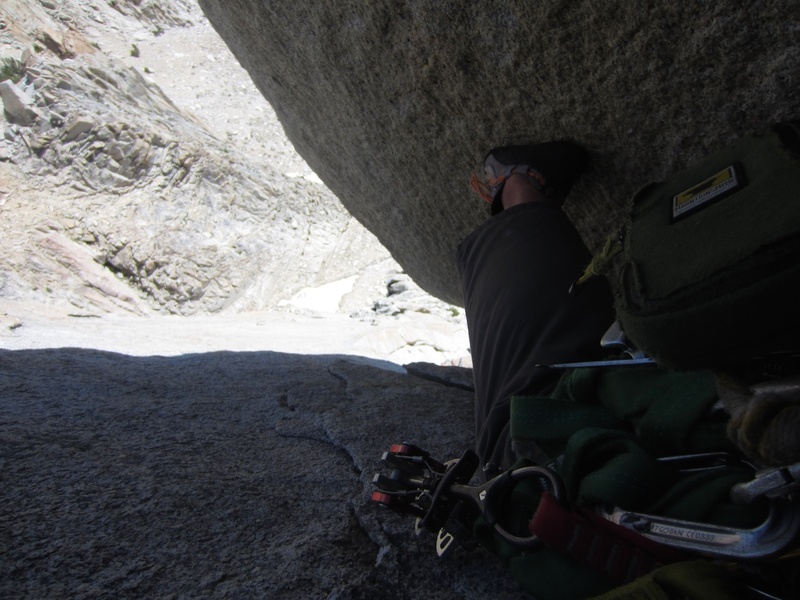 The second 10b crux on Pitch 5. This crux was definitely more of a mental crux for me than the first, since the gear is thin and there's a ledge right below. I was able to place two small nuts from my stance on the ledge, and a black alien half a move above the nuts, and a green alien a move above that. The green alien was bomber. 20. 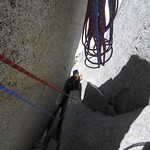 Looking down Pitch 5 from my belay perch at the top of the Pillar. 21. 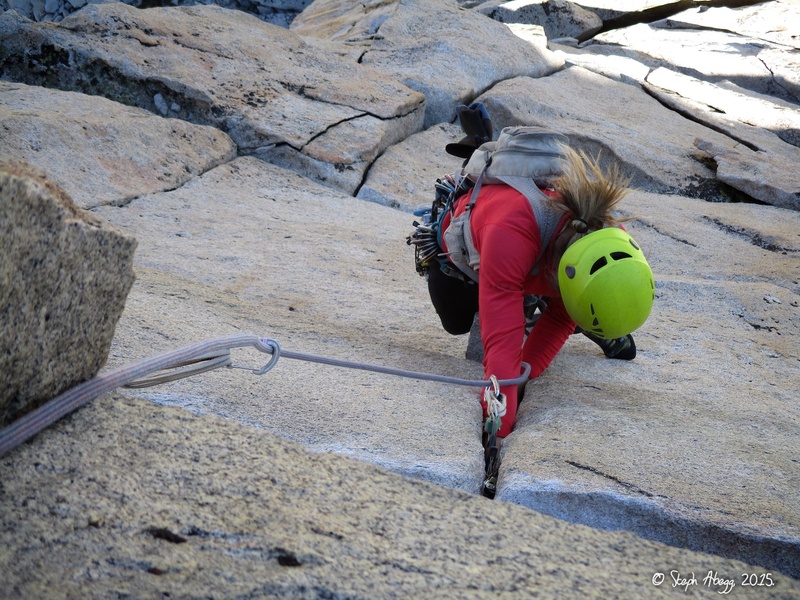 Sarah on the "best 5.9 in the universe" at the end of Pitch 5. 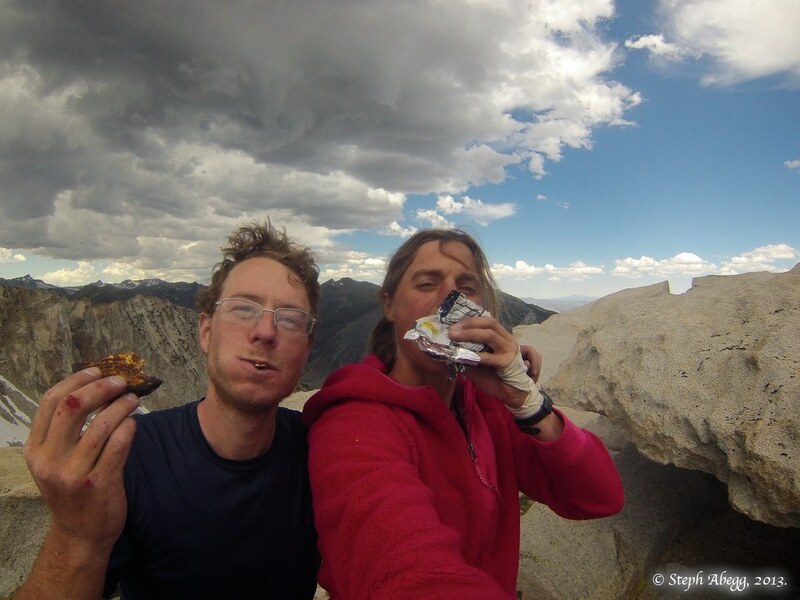 That might be a bit of an overstatement, but it's pretty darn good climbing and quite a way to finish the route! Summit! 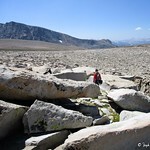 You top out on the Dana Plateau. 22. 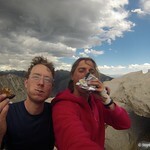 In celebration of Two Pi Day (3.14x2=6.28=June 28), Mark and I devoured two Moon Pies on the summit. 23. 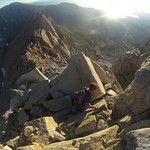 Mark on top of Third Pillar of Dana, holding up our rack. 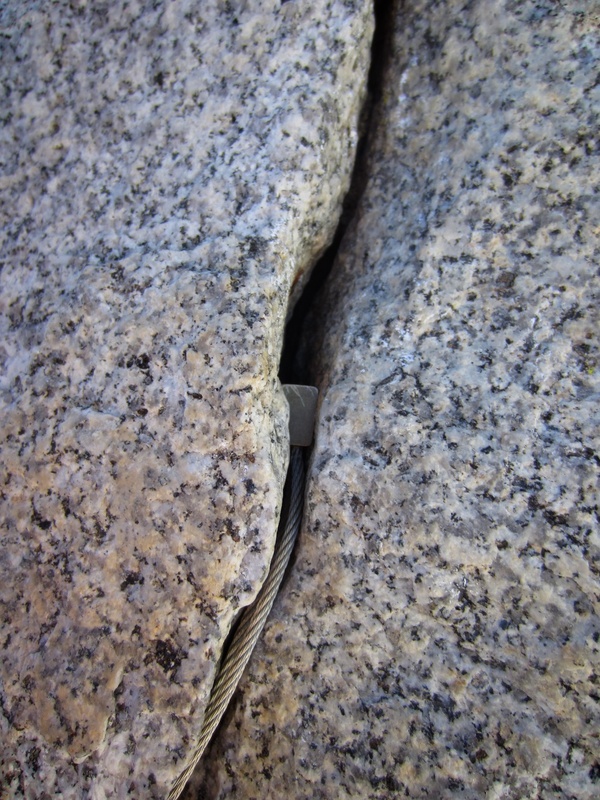 Our rack consisted of doubles from 0.4" to 3" (this included 1 set of Metolius offsets), one set of nuts, small-to-medium offset brassies, about dozen slings. The offset cams and nuts were quite useful on the cruxes. Sarah and I had a similar rack, but only brought one #3 (only one is needed) and had aliens instead of offset cams, which were equally useful on the cruxes. 24. 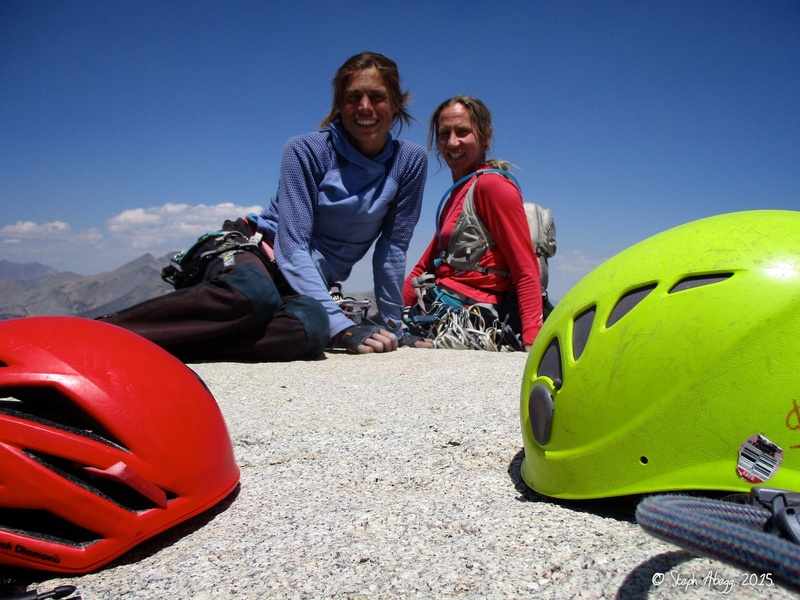 Steph and Sarah on top, with helmet hair. 25. 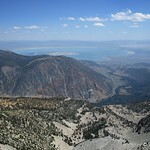 Mono Lake as seen from the top of Third Pillar of Dana. Descent Hike out the same way you came in. 26. Sarah beginning the hike out over the way cool Dana Plateau. A little less than 1.5 hours to the car at a relaxed pace.